Rebekah MacAuley from Carr Primary School and Kate Gordon from Meadow Bridge Primary School accompany the Mayor of Lisburn, CIIr James Tinsley, on his official duties on Wednesday 18th June, after winning the short story competition If I was Mayor for the day'. 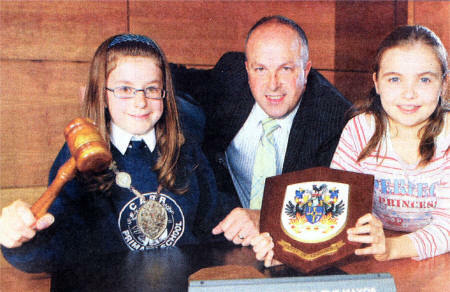 TWO schoolchildren have got an idea what it would be like to be Lisburn's Mayor - for one day anyway. Kate Gordon from Meadowbridge Primary School and Rebekah Macauley from Carr Primary School were selected by the real Mayor, Cllr James Tinsley, to join him in being First Citizen for the day on Wednesday. 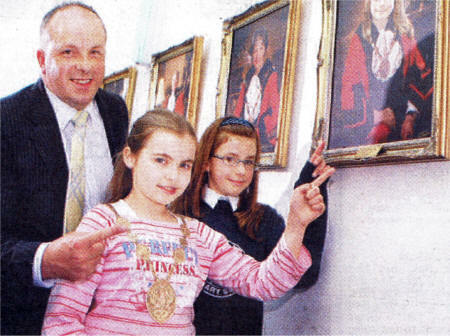 The girls were selected from a total of 13 local Primary Schools who sent in their short stories of what they would do if they were the Mayor for the Day, as part of the 2008 programme of Primary School visits to meet the Mayor and learn about his role and that of Lisburn City Council. In her story, Kate said that she would declare it 'Lisburn Children's Day' and first thing in the morning she would call an immediate debate to discuss facilities for children and young people in Lisburn. Her day would finish with a special 'Lisburn Together' party at Lagan Valley Island and she would go home for a long, and well-deserved, sleep. On the other hand, if Rebekah was the Mayor for a day, she would take all the young carers of Lisburn on a day trip to Newcastle to free them up from their caring responsibility for .one day and would send in a grown up carer in place. She thinks this would be a great visit for the children, as some of them may never have been to the sea. Cllr Tinsley said he appreciated all the help on the day. "There was no better or busier day than Wednesday to show Kate and Rebekah first hand what is required from the Mayor" he said. "The day was packed with events, including the official reopening of Castle Gardens anc the Lisburn Half Marathon and Fun Run. "The girls even managed to fit in a visit to the local community radio station, BFBS, to see how the station works and meet the presenters." "As my mayoral year draws to an end, it was very fitting that I could share my experience with some of the younger members of our community. Who knows it may even give them a taste for pursuing a life in politics. "The enthusiasm they displayed is to be admired and I would like to sincerely thank them for all their hard work on the day. I wish them both the best of luck with their education and career that follows, no matter what they decide to do."